From positions in all directions around the peninsula and mountains, the courses here offer easy access from city while transporting you to a world away from its action. Whether its right in the city at the newly-designed Metropolitan or historical Royal Cape or a bit out of town at Steenberg. It’s hard to choose from all three, so best to choose all three, and it’s easy to do given the close proximity. Each gives a different viewpoint on city and surrounds: from Steenberg’s views of the Muizenberg Mountains and lush Constantia Valley to The Met’s views of Cape Town’s magnificent new stadium and backdrop of Lion’s Head or Royal Cape’s quiet corner in the leafy suburb of Wynberg. This colorful coastal city, humid and tropical, is a lesser-known outpost for the sport. 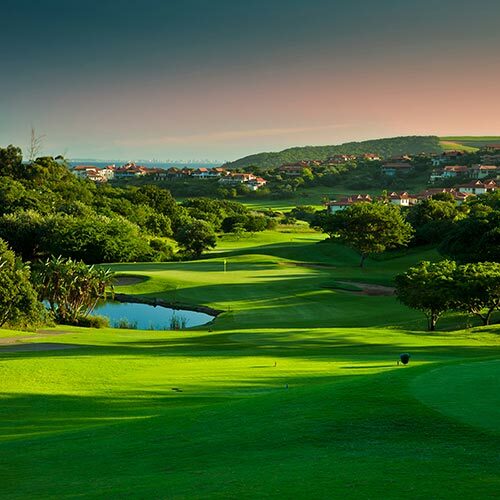 Such notables as Durban Country Club, and further afield Zimbali, Prince’s Grant and Wild Coast are accessible from this coastal hot spot. All take advantage of the scenic beauty from wide open coastline to rolling sugar cane fields to transport you to what feels like an island far away. 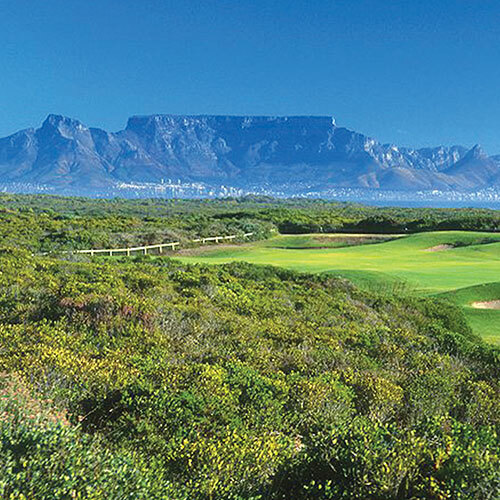 Paired with the Cape, the juxtaposition makes for a diverse and rewarding golf itinerary. And nearby safari options add to the repertoire. Fancourt, Oubaai, Pezula, Simola, Pinnacle Point…just to rattle off a few of the golf paradises that dot the Garden Route. Called as such because of its lush and diverse vegetation, it extends from the Western Cape province east, ending in the far reaches of the Eastern Cape. Mild in its climate, it’s an ideal golf destination all year long, with its flowing coastline dotted with lagoons, waterfalls, scenic bridges and ragged mountains. It’s possible to explore the nooks and crannies of this area for a week or more, evening taking up residence in lovely neighborhoods in Knysna, George and the smaller Sedgefield or Wilderness. Weave your way out of Cape Town, along the breathtaking R44 coastal route, where it’s possible to see whales breaching and dolphins leaping. 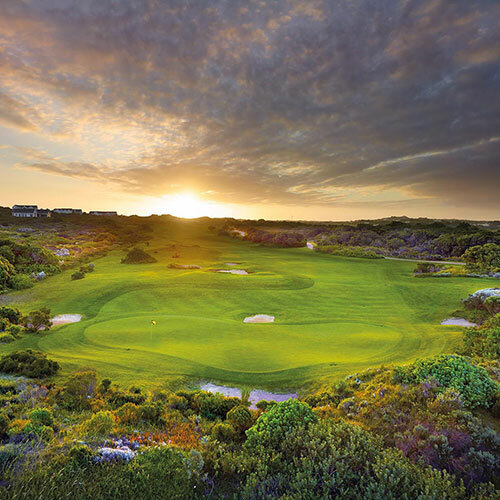 Your destination is the coastal village of Hermanus – recognized globally as one of best land-based whale watching spots – but for you, it’s about golf. With ocean on one side and picturesque mountains on the other, it’s easy to lose oneself in the beauty. 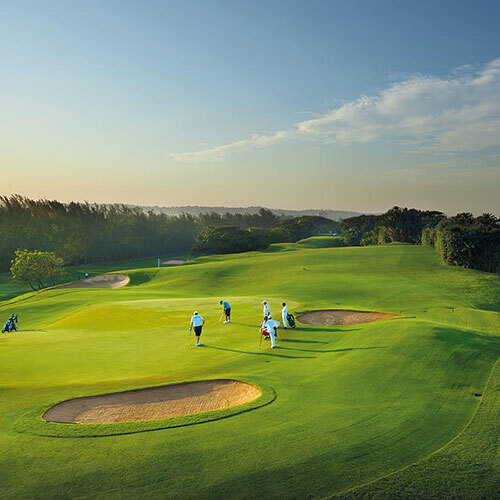 Tee off at Arabella Golf Club, in the morning, and have a nice walk along the cliff path at sunset. Set on the shores of a large lagoon, and in close proximity to the Hemel en Aarde Valley, one of South Africa’s renowned wine regions, the course is challenging, yet the rewards are many. Marrying two somewhat contradictory past times – safari and golf – is the Kruger region. 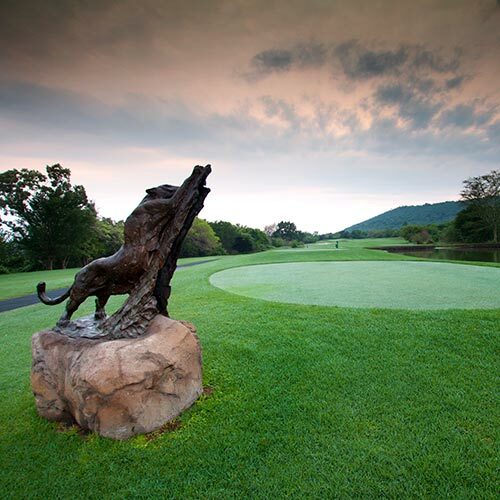 Home to the famous Leopard Creek course, the baby of Johann Rupert, winemaker of note, safari aficionado and golf lover, this course is set on the southern doorstep of the enormous national park. Best paired with safari, we recommend staying in the park or one of its neighboring safari lodges, and enjoying a quick day trip to play the course. 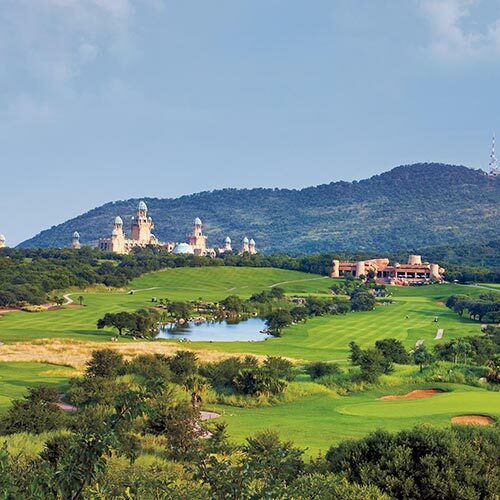 It’s also proudly South African by waving the Gary Player design flag, and holding the esteemed position of 2nd best course in the country to Player’s Sun City course. A truly unique golf destination. Home to two Gary Player courses, this is arguably South Africa’s most internationally-recognized golf epicenter, and considered the best. 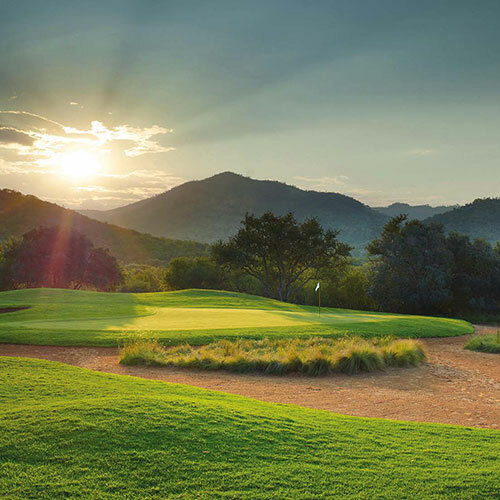 Just a couple hours north of Johannesburg, tucked nicely against the Pilanesberg National Park, this is a golf resort in the true sense of the word – numerous entertainment and accommodation options, destination getaway, hiking in the surrounding mountains, but for the avid golfer, it is a coveted stop on the South Africa circuit. Consisting primarily of three key wine villages – Stellenbosch, Paarl and Franschhoek – South Africa’s wine region is also associated with excellent golf. Surrounded by the intersection of a number of the Cape’s mountain ranges, the scenery is peaceful and dynamic – working vineyards, diverse fynbos, flowing waterfalls – there is no doubt that 3 days here is even not enough. Our favorite course here is one of Nicklaus’, Pearl Valley. Like all his namesake courses, this does not disappoint. Meticulously maintained, breath-takingly beautiful and excellent year-round, to play its holes among Paarl’s mountain backdrop is a perfect complement to day’s spent wine tasting and exploring.